Every weekend, I look forward to sleeping in (which, for me is usually 8:30 AM), brewing a big pot of coffee and tuning into the Food Network. Sometimes I'll view the butter-drenched cookery of Paula Deen, other times I may see what budget eats Dave Lieberman is creating. There are only a couple things I MUST do when it comes to watching the Food Network on the weekends- 1) Avoid Sandra Lee or Rachel Ray like the plague and 2) Watch Barefoot Contessa. 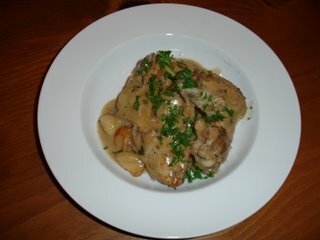 I love the nice, low tone of Ina Garten's voice as she whips up beautiful meals made with fresh ingredients. Some of her food is a bit on the heavy side, yes, but at least she makes it with fresh cream and locally bought cheese. Don't you love how everything is just fabulous, or how almost everything she makes is for her dear husband because "Jeffrey's going to love it?" I'm sure I'd love pretty much anything if I lived in that beautiful Hamptons house, being waited on hand and foot....but the food really does look very appetizing. There are quite a few of her recipes I've been meaning to make, but none more appealing than her Chicken with Forty Cloves of Garlic. It seems like the perfect cold weather food, and with all of the rain/cold we've been having (I know I know- I'm a whiny Los Angelino with nothing to complain about) I thought it'd be perfect for dinner. I love anything that is made in one pot and left to simmer in the oven or on the stovetop while the smells permeate the house, and this is that kind of dish. 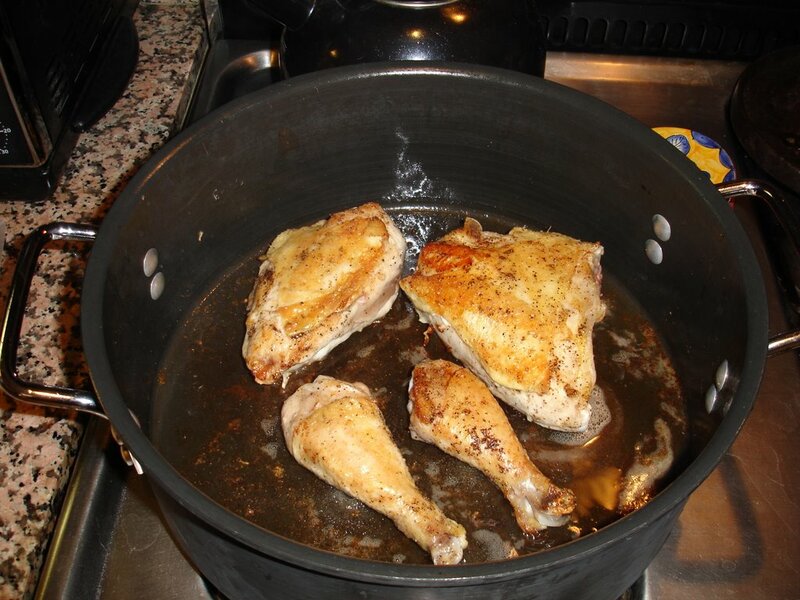 The chicken is so easy to make- just brown the chicken, remove from pan. 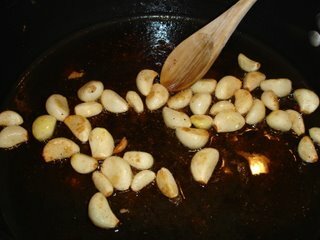 Then add the garlic to the fat (I drained all but 1 TBS of fat before adding the garlic- the recipe does not say to do this but really....you don't need all of it) and brown. Deglaze the pot with congnac, add the chicken, herbs and white wine and simmer for 30 minutes. 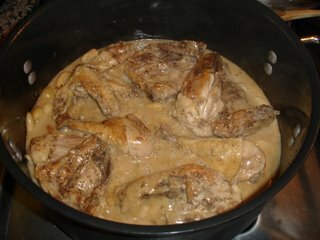 Make a roux with some of the liquid and flour, add back to the pot and finish off with a bit of cream. You can find the recipe in full here. The flavor of the wine mixed with the garlic and cognac was so deep and delicious. The garlic cloves end up being soft and sweet. I served it with grilled ciabatta which we smeared the garlic cloves on and added an herb salad (Trader Joe's makes an amazing bagged herb salad with mixed greens, dill, Italian parsley, etc)to make the meal complete. As Ina would say "How bad can THAT be?" 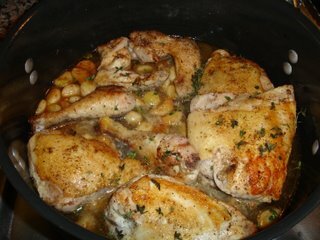 I could almost smell the chicken and garlic!!!!! Your taste regarding the food network is much the same as mine. (must be a hapa thing). Love Ina (and Jeffrey) and Paula....Can't stand to hear "fantastic" Ms lee and RR. The sunday paper and Food network. Sounds great to me. I feel you on the Sandra Lee and Rachel Ray. All Sandra Lee says, "(fill in the blank) is to die for." Plus her cooking is weak sauce. Rachel Ray is plain annoying. I can't stand her voice. And can she just keep her hands still? Calm down woman! Oh, and your chicken looks awesome!!! Carlyn and Jeni: Let's start an Anti RR/SL blog. Just kidding....sorta. 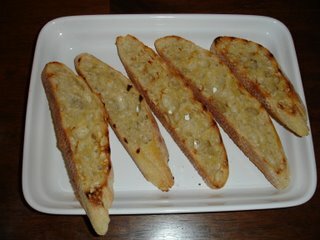 in the words of ina, "i can smell those GORGEOUS garlic cloves." also....i have to say sandra lee has become my guilty pleasure. i think it started when she made some freaky aunt jamima mini pancakes w/ cocoa powder, topped with salmon and dill...YIKES. ever since then it's been like slowing down on the freeway to get a gook look at the car crash. i can't look away!!! !